We attach great importance to the quality of our products and customer service. We offer for all the products sold in our stores a warranty that protects you from manufacturing defects. To benefit from our warranty, you must absolutely keep your receipt, your warranty card and your box which act as a "warranty certificate". 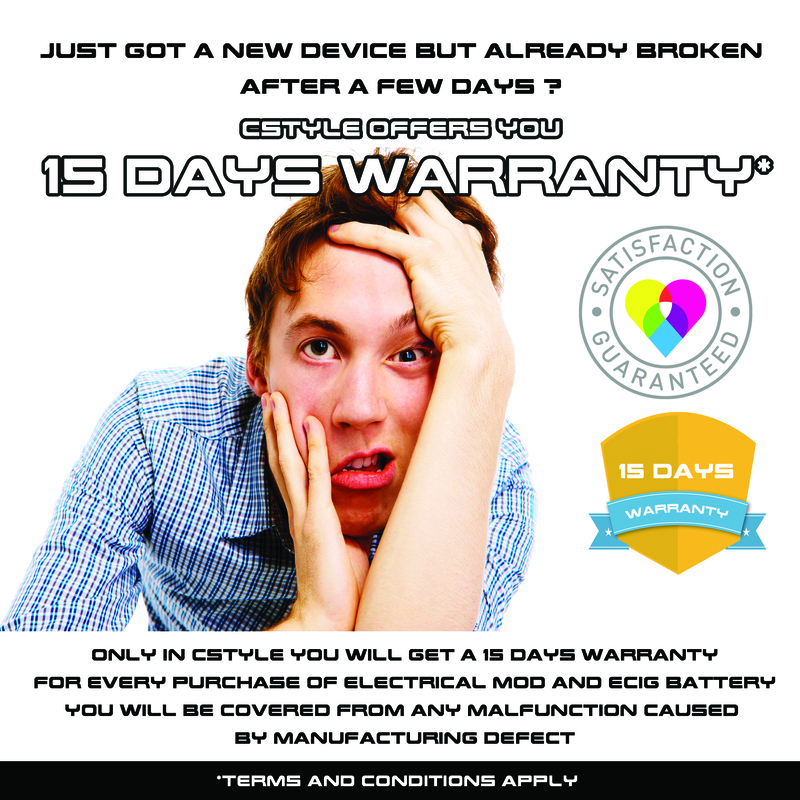 We offer you a 15 days warranty from the date of the purchase. No warranty will be accepted after this time. Due to the specificity of the product, we do not offer any warranty for MOD battery (external battery). We offer a functional warranty only the day of your purchase when you are in the shop. At the time of your purchase, we invite you to try the product with our team to check its condition. If it does not work, our team will exchange it immediately. If the product works, the warranty expires and no return or exchange will be accepted as soon as you go our from our store. This product has no warranty. CSTYLE offers free testers to ensure that the liquid you choose suits you. With the desire to offer you safe and non-open liquids, no return or exchange will be accepted. • Damage resulting from improper use according to the manufacturer's specifications, or usage not respecting the preservation of the device. The warranty covers your product against hidden defects causing default or malfunction. All returns are subject to review and agreement of CSTYLE customer service before authorizing repairs or replacements.